It’s one thing to hear that 1,000 people in Central Texas have been displaced by recent floods but quite another thing to meet some of those people. Today I had the opportunity to meet three families in the small subsidized housing community where our Disaster Response Team has served the past couple of days. My heart has been heavy all day as result of listening to their personal stories. We started our day with an early breakfast followed by prayer. 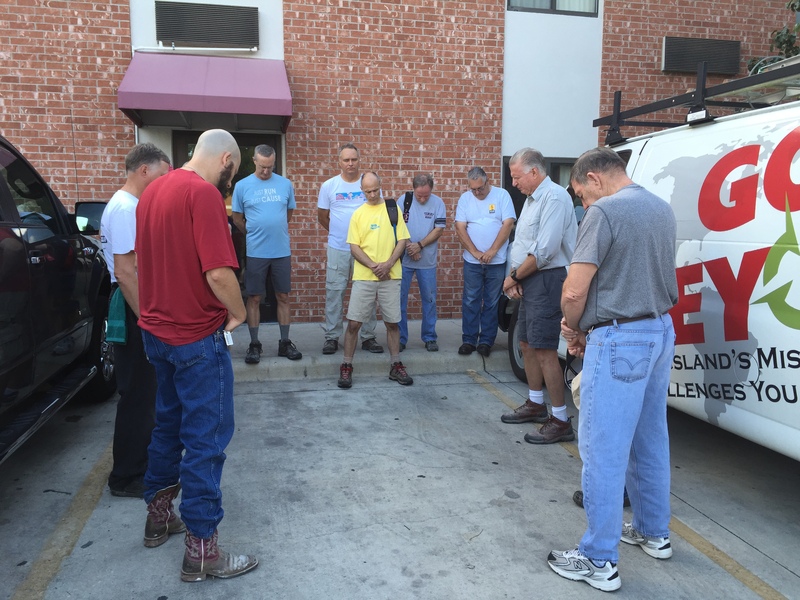 Monte Vincent, our missions ministry’s point man for our disaster response initiatives, led our men in prayer. He asked that the Lord would use us to be a blessing and encouragement to those we have come to help. Today, we had ample opportunities to do both. This morning I met a man and his daughter-in-law who were moving out the last of their personal belongings from their modest little duplex. He spoke to me in Spanish and told me about all of the things they had lost when their home flooded. He was worried sick because the vouchers they had received to stay in a hotel were good only until Sunday. After that, he and his wife, daughter-in-law, and grandson would have no place to live until their little home is repaired. Later in the day I noticed two older women sitting on a bench outside of the homes where we were working. I approached them and asked them to tell me their stories. One of them has lived in the same home since 1972. The other has lived next door for less than a year. Neither of them have any family that they can lean on. “So we only have each other now,” one of the women told me. Once again, they will have no place to live while their homes are being repaired. Their hotel vouchers are valid only through this weekend. One of the women has a car. The back seat was filled with the few possessions they were both able to salvage. I told them that the people of Kingsland had sent us here to bless them. So, I filled up their car with gas, bought them some groceries, and gave them gift cards to get through the coming days. I know it’s only a short-term solution but it meant so much to them. They cried. Every place we worked at today has a story associated with it. 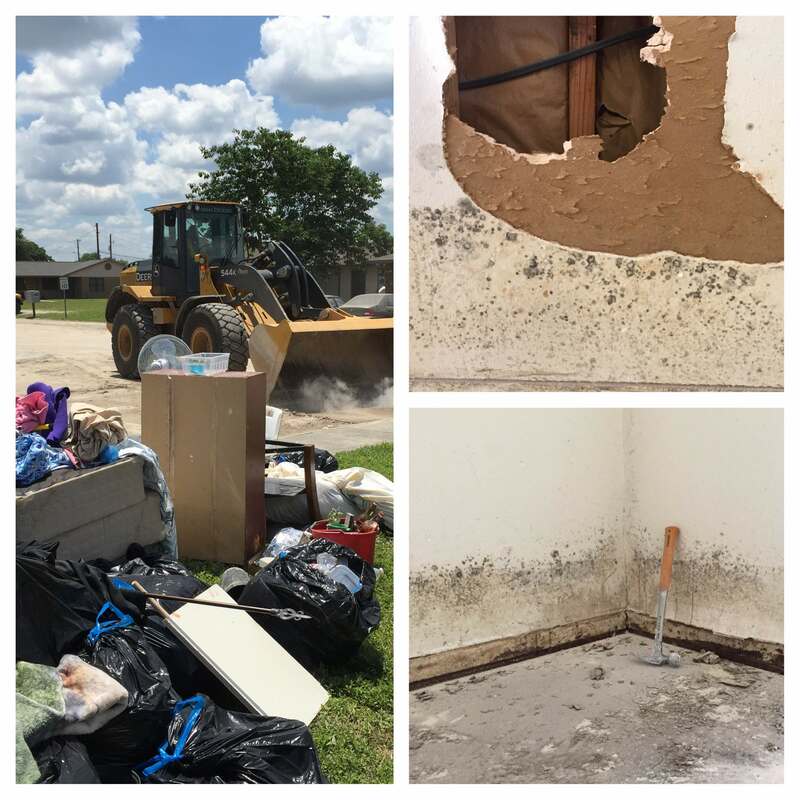 I can’t help but wonder about the people who have had to move out of the homes where the guys and I have been removing sheetrock to help expedite repairs that will follow. If the damaged walls could talk I wonder what stories they would tell about the fear that gripped the people when the flood waters came rushing in and turned their lives upside down. Mother Teresa once said that it is a kingly act to assist the fallen. We certainly want to honor our King by helping those in need here in San Marcos. Yesterday, three local young men joined our team and worked alongside us. As they drove off at the end of the day one of them leaned out the window and said, “Thanks for coming to help the people of our town.” We are all glad that we came and that we have had the opportunity to help. Thanks for praying for us and for the people whose stories will never be heard by anyone but God. I love what Kingsland Baptist is doing! Thanks for all you are doing to help these people! I can see God smiling! I hate they had to go through this. Praying! Thanks for your prayers, Beth. Thank you Pastor Omar and your team for this great work!